Of course, since I am a grandma, that means I have a perfectly adorable and very special grandchild, which means in my case, a beautiful little girl. She’s almost three, and of course, she’s as special in intellectual aptitude as she is in the beauty department. Since she has attained such a great age, it’s obviously time to introduce her to the beauty of baking. Sanity obviously does not run in our family. To be honest, I did consider making no bake cookies, but…I was a bit shy in the peanut butter department. So what did we decide to make? I’d never heard of such a thing, but to be honest, entertaining a 2 yr old who is going on 3 does not leave a lot of attention for cookie baking, especially when you are out of practice. Yeah, I remember doing it when I had a toddler…but I’m a lot…more experienced, shall we say? I also get tired and injured. I’d already had a head trauma incident, I was hoping to stay off the casualty list for the remainder of the day. Bars, with a single 25 minute baking time, sounded like a great idea. They were good…but a bit bland for my tastes. They did taste a lot like snickerdoodles, but the cinnamon flavor was not very intense. The texture isn’t soft like a brownie, nor is it crispy like a regular snickerdoodle, but somewhere in between. Cut into small squares, I can see these being popular with the younger set (like the granddaughter) with their not-too-sweet, mild flavor. They’d also make great lunchbox desserts, as well as afterschool snacks. I thought they were pretty good with milk. Sift flour, powder, and salt. Set aside. In a large bowl, beat butter, brown sugar, eggs, and vanilla until smooth. Stir in the flour mixture. Spread evenly in a lightly greased 9×13″ pan. Combine the cinnamon and sugar together to make the topping. Sprinkle mixture on top of the batter. Bake 25-30 minutes. Cook slightly. 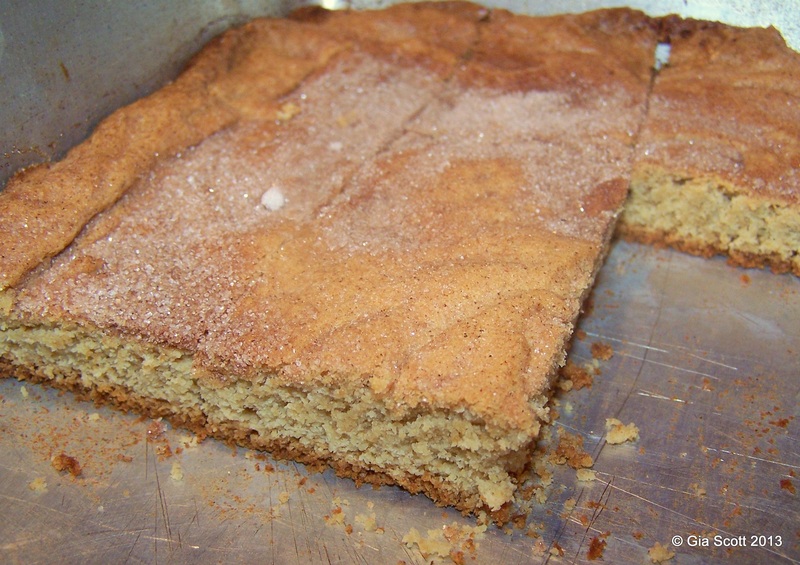 Cut into bars with a sharp knife while the Snickerdoodle Blondie Bars are still warm. This entry was posted in Budget, Cookies & Bars, Easy, Potlucks & church suppers, Quick, Recipes and tagged budget, cookies, easy, family, recipe. Bookmark the permalink.